Hello and WELCOME to the home of Cupcake the Clown! 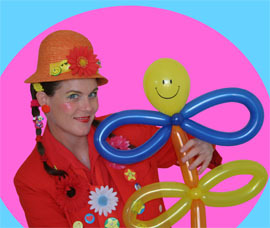 Here you'll find the Best Balloonology, with Fabulous Facepainting, Tricky Magic Tricks and a Super Magic Show, Marvellous Music (with original Silly Songs just for you! ), Greatest Games, Beautiful Bubbles, and lots of silly Clowning Around for children of all ages through to adults. Cupcake travels to all locations in the Melbourne Metropolitan area (Australia) - and beyond! She loves to join in the fun at all sorts of exciting events! At home or at school; at work or at play; for celebrations large and little, Cupcake loves to come along and have a wonderful time with everyone! Please come in and enjoy the FUN! Cupcake the Clown is the proud winner of the award for "Most Creative Design" and "Best Catwalk Display" at the "Twist it 2008" Balloon Convention, held in October 2008. Congratulations! Cupcake the Clown won the President's Award for the Australian Society of Magicians Annual Closeup Competition, held in October 2007. Hooray!